During an illustrious 14-year NFL career with the Arizona Cardinals and St. Louis Rams that included eight Pro Bowls and four All-Pro selections, cornerback Aeneas Williams came to a realization -at times in the locker rooms you’d hear about the rough patches in players lives. This unhappiness wasn’t fueled from anything that happened on the field, but it came from something that was missing in the players’ lives. Aeneas, who had made his personal commitment to God during his junior year at Southern University, knew what was missing, just like he knew how to salve those wounds. That was when Aeneas first began speaking and spreading his message “Reaching Your Potential”, which is the foundation for his current interactive speaking engagements. “A number of players had made the pinnacle, but for all their successes, it didn’t look like their families were enjoying it,” Aeneas said. “I saw past the surface of people and saw a true hunger and need for peace. As a standout in the NFL, Aeneas finished with 55 career interceptions and nine defensive touchdowns. The Arizona Cardinals inducted Aeneas into their Ring of Honor in 2008, and he was selected to present the Cardinals with the George Halas trophy after the 2009 NFC Championship Game. Aeneas has attacked delivering his message with the same fervor that spurred him to innumerous heights as a player. It’s a message based on passion and self-motivation, a message founded in the belief that striving toward potential is divinely inspired. And it’s a message that is easy for Aeneas to relate to his audiences with his own career as an example. 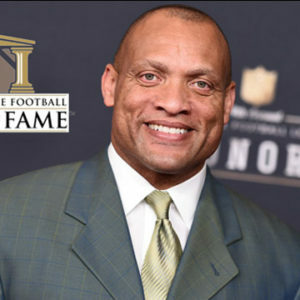 To book Aeneas Williams as a keynote speaker, please complete the booking form above.